Framingham, MA � has expanded the offerings for its S1 Pro multi-position PA system � the ultimate all-in-one PA, floor monitor, practice amplifier and primary music system, and the latest addition to the Bose portable professional product line. The S1 Pro�s full complement of accessories and enhancements now includes the new S1 Pro play-through cover, which is set to be available to the public in May 2019 in multiple colors. Additionally, each S1 Pro comes with a pre-installed rechargeable lithium-ion battery pack and compatibility with the Bose Connect App for streaming Bluetooth� audio to as many as two S1 units. Other optional accessories include the S1 Pro Backpack and S1 Slip Cover. At only 15.7 lbs (7.1 kg) and with dimensions of 13" x 9.5" x 11.2" (330 x 241 x 286 mm), the ultra-portable and rugged S1 Pro is lightweight and designed for effortless transport using the convenient carry-handle. The S1 Pro is engineered to be used in four different positions to accommodate a wide range of applications � tilt-back, elevated, mounted on a speaker stand, or placed on its side (as a floor monitor). Built-in sensors detect positional changes and trigger Auto EQ, which automatically recalibrates the system�s internal settings for each different placement/application, ensuring that users always sound their best with optimum sound in any position. The S1 Pro comes with a three-channel mixer. Reverb and tone controls are featured on two channels with XLR/quarter-inch combo jacks, and a third channel is for either 3.5 mm (1/8�) line-in or wireless Bluetooth connectivity. Additionally, a line-out jack offers easy expansion to other systems. 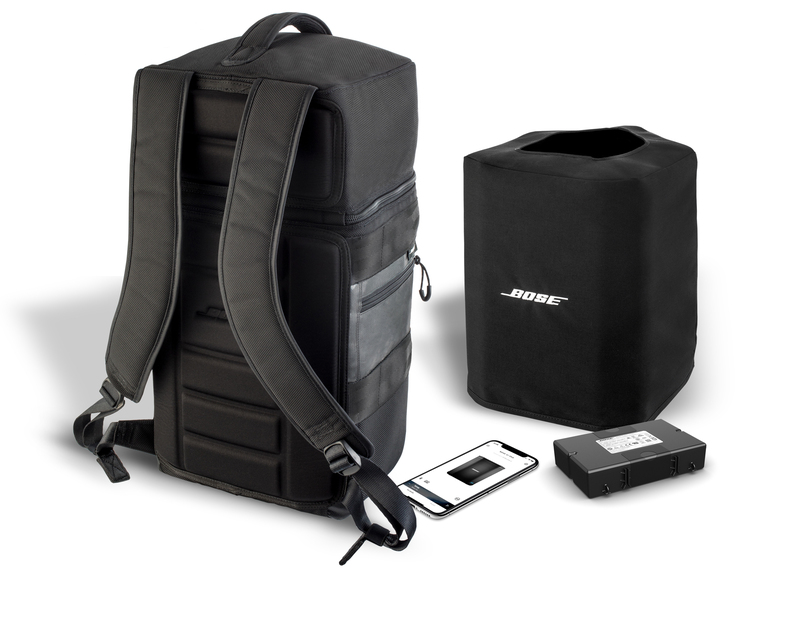 The optional S1 Pro Backpack is designed for hands-free transport of the Bose S1 Pro system. Three zippered compartments allow cables and other items to be safely stored, while the adjustable shoulder straps, molded foam back panel and convenient handles allow users to comfortably carry their S1 Pro system anywhere they travel. The optional S1 Slip Cover allows users to protect their S1 Pro system while on the go. This custom-fit cover easily slips onto the S1 Pro, providing scratch protection while carrying, traveling in a car, placing in an airplane overhead compartment, or when just storing. Made from durable nylon, it features an embroidered front Bose logo and a top opening for accessing the S1 Pro carry handle. The S1 Pro multi-position PA system is currently available with a U.S. MSRP of $599; S1 Pro Backpack MSRP is $149 and the S1 Pro Slip Cover MSRP is $29. For more information, visit BOSE.COM/S1.